I worked on a project that required high performance wood filler. The wood filler is specifically designed for outdoor use as such it hardens like rock and requires clean up with acetone. 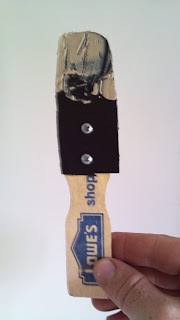 For this project, I made my own putty knife with a disposable plastic blade. I used plastic from a square, 4" plant container. The kind you usually buy with perennials in the spring. The plastic on this particular container is easily pliable but offers enough spring to adequately handle puttying. Attach the knife to the handle. Your mileage may vary here and you will have to get inventive. 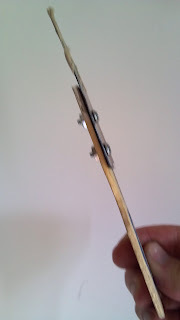 I considered using a couple of dry wall screws, cutting them flush and using duct tape to cover the cut ends. I was lucky enough to find matching machine screws and nuts in my junk bin. Use what you find in your junk drawer. If you're going to the store to buy fasteners then you're Doing It Wrong. The finished blade is about 3" long. I also put a hole in the handle's end and ran a twisty tie through it so I could hang the tool. I used it and it worked well. I was able to mix the putty and apply it OK. When I was done I undid the nuts, slipped off the knife and threw it away. For the knife cut the plastic into a 5" long by 1 1/2" wide rectangle and trimmed off any uneven bits from the top of the container. The finished length was 4". I rounded one side of the rectangle. Cut an old paint stick into a 5" handle. The paint stick is the free kind you get from any big box hardware store. They'll give them to you for free if you ask. I had a used one laying around that I was going to throw out anyway. Attach the blade to the handle. Clamp the handle and knife together and overlap the blade and knife by 1". Drill two small holes about 1/2" apart, leaving 1/4" on each side. This is important as you do not want to split the handle. 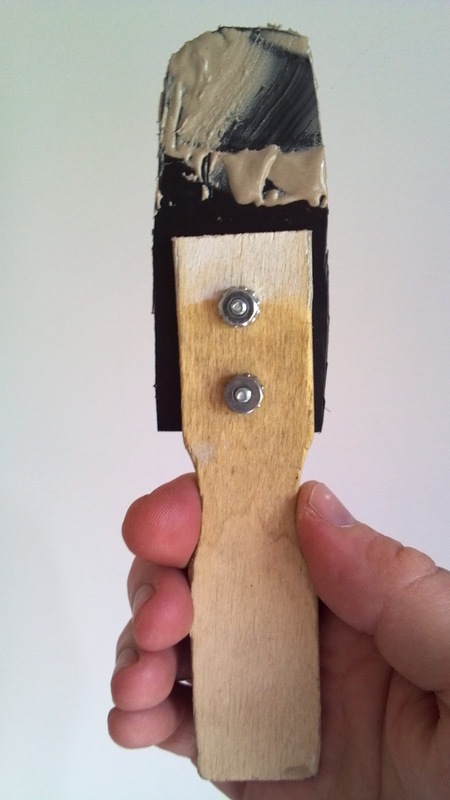 It is a cheap paint stick and will split easily. Insert two 3/8" long, 1/8" diameter machine screws into the handle. Slip the plastic blade over the screws. Fasten with nuts. Hand tighten and give it a 1/4 or 1/2 turn with a pair of pliers or small wrench.